Cracking The Lychee 'Nut' Don't let the prickly skin deter you. Beneath that tough exterior is a bold, luscious fruit with tons of potential, from savory main courses to dessert. Get recipes for Red Curry With Roasted Duck And Lychees, Seared Tuna Steaks With Lychee Salsa, Stir-Fried Chicken With Lychees, Lychee-Plum-Apricot Crumble, and Lychee Cocktail. It was hour two of the bus ride from San Jose, Costa Rica, to the center of San Isidro, and I was hot, dirty and tired. Droopy eyed, I gazed out the bus window. The sweet flavor [of the lychee martini] immediately transported me back to Costa Rica and reminded me of afternoons spent peeling back the skins of the rambutans and sucking in the pulp and juice. "Mamochinos, mamochinos!" children yelled at the edge of the clay-caked road, holding up plastic bags of what, to me, looked like sea urchins: red, spiky balls with yellow tentacles shooting out from a rough shell. The bus pulled over, and within moments our trip leader was passing around bags filled with these strange objects. As I took one in my hands, the spikes tickled my palm. I turned it around and around, expecting an eye to open or a tentacle to take hold of my finger. However, it stayed perfectly still, as a fruit should. I had discovered rambutans. Following my peers, I dug my nails into the prickly skin and peeled it back. Inside was a white, pearly pulp, shining with juice. As I popped the fruit into my mouth, the flavors danced on my tongue. It was like a grape, but with stronger, bolder flavors, a substantial shell and a large brown nut in the center. Rambutans belong to the same family, Sapindaceae, as lychees and longans. Peeled, the three fruits are hard to differentiate. Unpeeled, lychees resemble rambutans without the hair, as do longans, which are smaller, green and also hairless. If I had been introduced to this fruit family with the tentacle-free lychee or longan, the experience might have been less intimidating. 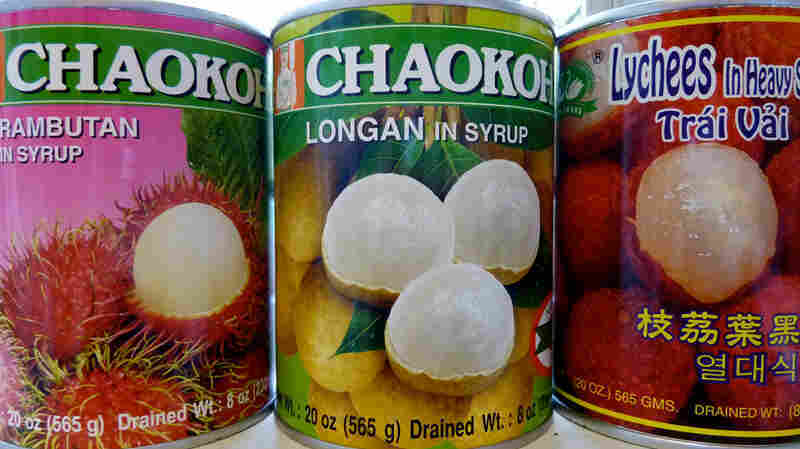 Canned rambutan, longan and lychee fruits -- all part of the Sapindaceae family -- can be found in supermarkets. 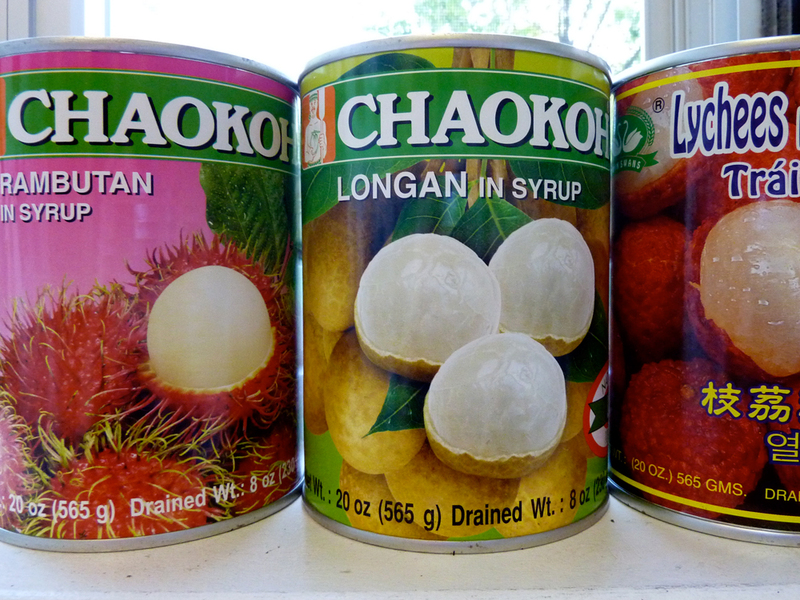 Of these three, lychees are the most easily found in the United States. Though native to southern China, where they have been cultivated for 2,000 years, lychees are grown in the United States as well as throughout Asia, Africa, Australia, parts of South America and Central America. Possibly because of the Chinese affection for lychees, they are often associated with Chinese cuisine. According to a Chinese folktale, Lady Yang Kuei Fei of the Tang Dynasty (A.D. 712-756) loved lychees so much, Emperor Xuanzong sent his men 500 miles on horseback to southern China to get his consort her prized fruit -- an act that some say caused this emperor's demise. During the later Ming Dynasty, men gathered to eat the fruits in a "lychee club." Eve Turow is a native Chicagoan currently residing in Washington, D.C. Often she can be found wandering the stands of D.C. farmers markets. She has previously written on the topics of food and travel for a local publication in Buenos Aires, and semi-regularly blogs about food, music and travel at Bacchus & I. In the U.S., lychee season begins in May and extends through the summer, with lychee farms having popped up in recent years in California, Texas and Florida. Do not let the growing season deter you, though. Lychees are available year-round in major supermarkets with a price tag of up to $3.50 for a 20-ounce can. I rediscovered lychees years after my initial introduction, in a swanky New York bar. A friend far more tuned into trendy drinks than I, ordered herself a lychee martini. 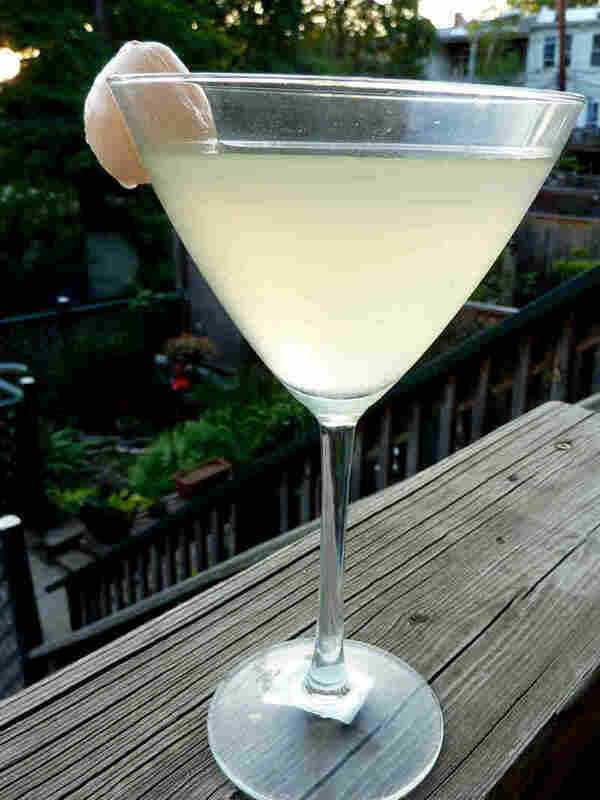 It arrived in a wide martini glass with a milky-blue hue and a plump lychee sitting at the bottom. I asked for a sip. The sweet flavor immediately transported me back to Costa Rica and reminded me of afternoons spent peeling back the skins of the rambutans and sucking in the pulp and juice. For such an easily found, fragrant fruit, it is surprising that lychees are not used more in U.S. cuisine. Lychees show up in frozen yogurt, bubble tea and martini glasses, but less often on dinner plates. 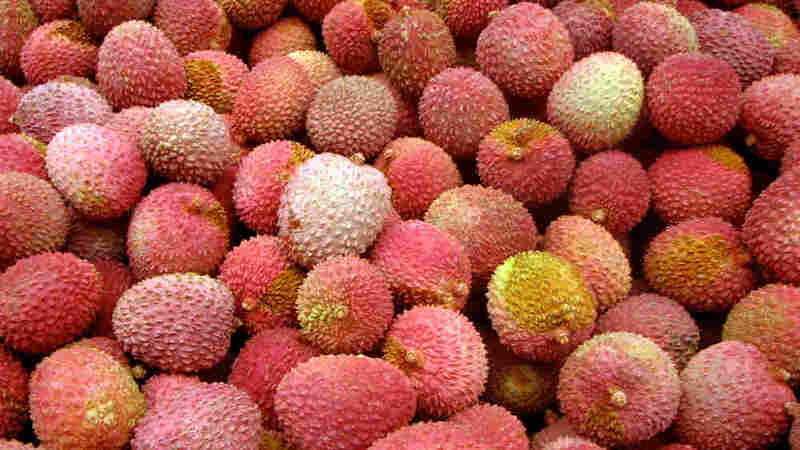 In China, however, lychees are commonly cooked with pork, shrimp and chicken; with duck in Thailand, and as a snack in places as diverse as Nicaragua and Australia. It seems time that North American cooks and diners invite the lychee into the kitchen. This is a traditional Thai dish often served on special occasions such as weddings and the New Year. The tomatoes and lychees are a perfect counterbalance to the spicy broth. To save time, buy a roasted duck and red curry paste at an Asian market or restaurant. 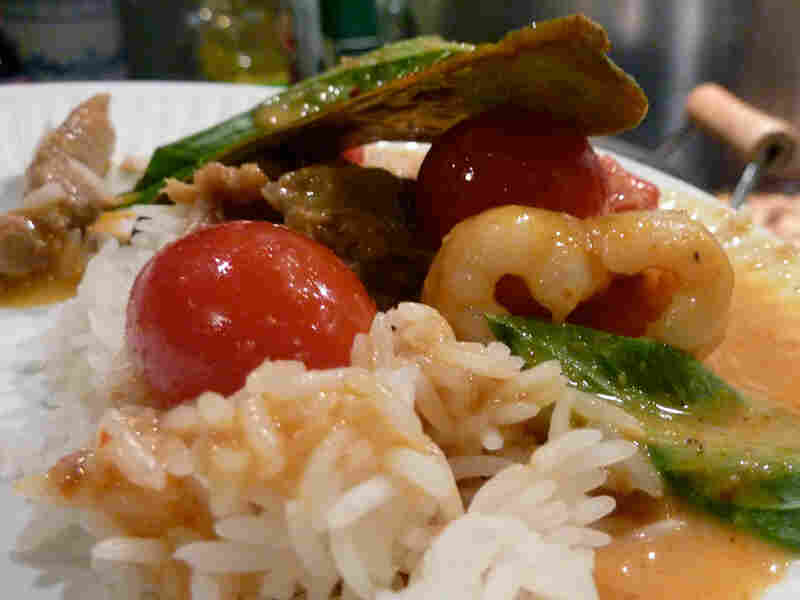 The recipe is adapted from The Food of Thailand: A Journey for Food Lovers by Pornchan Cheepchaiissara (Murdoch Books 2005). If you like a little less heat, leave out the red chili and reduce the curry paste by half. Lychees may be replaced with rambutans or longans. Put coconut cream in a wok or saucepan and simmer over medium heat for about 5 minutes, or until the milk separates and a layer of oil forms on the surface. Stir the milk if it starts to brown. Add the curry paste and stir well to combine. Add the roasted duck and stir for 5 minutes. Add the coconut milk, fish sauce and palm (or brown) sugar and simmer over medium heat for another 5 minutes. Add the lychees and tomatoes and cook for 1 to 2 minutes. Add the kaffir lime leaves. Taste and adjust seasoning. Spoon into a serving bowl and sprinkle with basil leaves and sliced chili to serve. 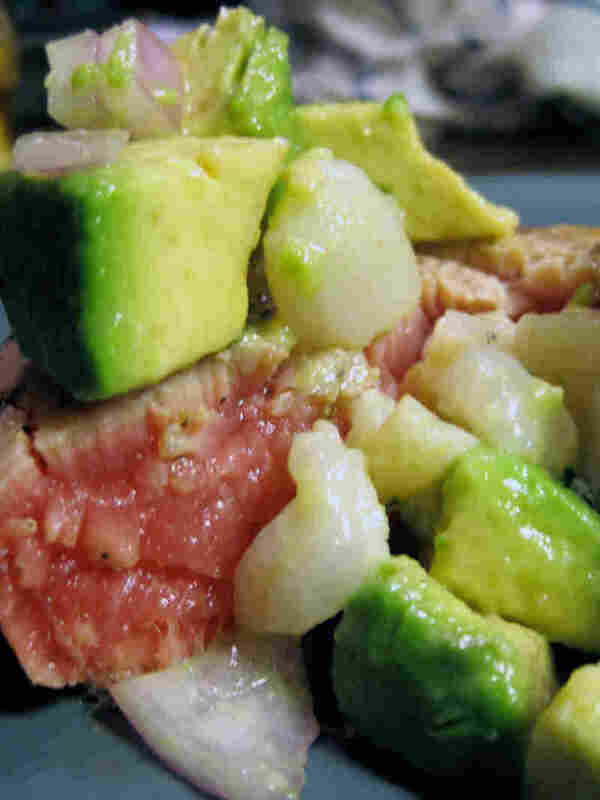 In this salsa, lychees blend perfectly with the flavors of the avocado and red onion and marry well with the seared tuna steak. The salsa can be used with a variety of foods: on tacos, quesadillas, as a dip for tortilla chips or even as a tasty side salad if combined with black beans and chopped jicama. You could even skip the cooking of the tuna, chop it into small cubes and toss with salsa to make a tuna ceviche. Combine all salsa ingredients and toss lightly with your hands, careful not to mush the avocado. Set the salsa aside or place in refrigerator while you prepare the steaks. Heat a skillet over high heat and drizzle olive oil in the pan, enough to coat the bottom. Season steaks liberally with salt and pepper on both sides. Once the skillet is heated, place the tuna steaks in the pan. Cook each side for approximately 2 minutes. You want the edges to be cooked but the middle to remain raw. Cook longer if you like a more well-done tuna steak. If you would like, turn the steaks on their sides and quickly brown the edges. When done cooking, immediately remove from heat, top with a generous serving of salsa and serve. Chicken with lychee is a traditional Cantonese dish, often combined with pineapple to create a sweet-and-sour chicken. This recipe is a little less sweet, with the savory garlic and ginger. 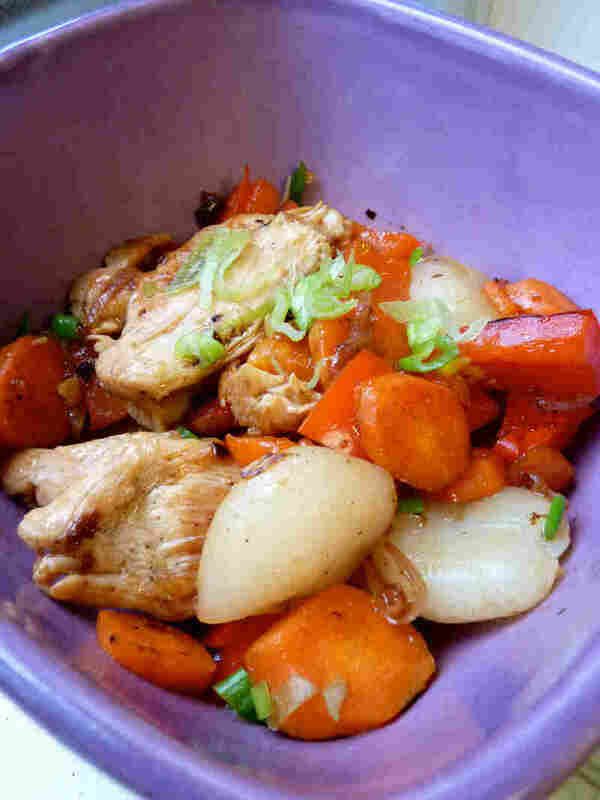 It is adapted from The Everything Stir-Fry Cookbook by Rhonda Parkinson (Adams Media 2007). Cut the chicken into small cubes or thin strips, as you prefer. Place the chicken in a bowl and add 1 1/2 tablespoons soy sauce, rice wine or sherry, Asian sesame oil, black pepper and 2 teaspoons corn starch. Marinate the chicken for 20 minutes, refrigerated. Combine the lychee juice and remaining tablespoon soy sauce in a bowl. Set aside. Dissolve remaining tablespoon cornstarch in the water. Set aside. Heat the wok or skillet over medium-high heat until it is nearly smoking and add 2 tablespoons peanut or vegetable oil. When the oil is hot, add the garlic. Stir fry for 10 seconds, then add chicken. Stir-fry until it changes color and is nearly cooked through. Remove the chicken from the wok and drain with a colander if necessary, or use paper towels. Add remaining tablespoon oil to the wok. When the oil is hot, add the minced ginger. Stir-fry for 10 seconds then add the shallot and carrot. Stir-fry until shallots begin to soften, then add the red bell pepper. Stir-fry for another minute, then add the drained lychees. Push the vegetables up to the sides of the wok and pour the lychee-juice mixture in the middle. Bring to a boil and add the cornstarch and water mixture, stirring quickly to thicken. When the sauce thickens, add the chicken back to the pan. Stir fry for another 2 minutes to mix all ingredients. Finally, stir in the green onions and serve hot. This crumble showcases summer fruits beautifully, and best of all, it is quick and easy to throw together. Best if served with ice cream. (Ideal flavors: vanilla bean, cinnamon, lychee or green tea, available at specialty stores or Asian markets). 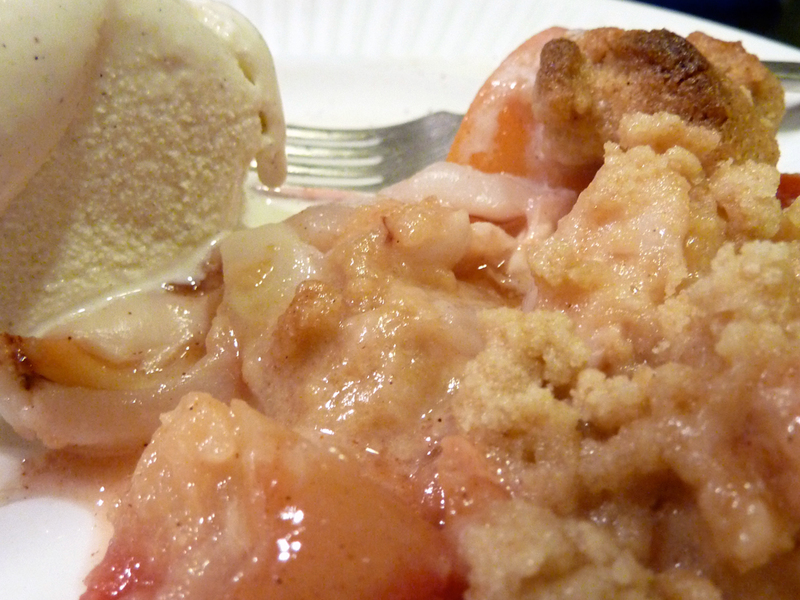 To prepare the crumble topping, combine dry ingredients in a mixing bowl. Cut butter into cubes and add to the bowl, mixing it in with your fingers until the batter resembles coarse crumbs. This can also be done in a food processor. Refrigerate until needed. For the filling, cut the plums and apricots into quarters, then halve each quarter crosswise. Drain lychees and add to fruit mixture. Toss fruit with sugar, cornstarch, cinnamon and lemon juice. Transfer fruit mixture to a 9-inch deep-dish pie pan. Remove the crumble topping from refrigerator and cover fruit evenly, breaking up the batter with your hands as you sprinkle it on. Place the pie pan in the oven and bake until crumble topping is starting to brown and fruit is bubbling beneath, 25 to 30 minutes. Let cool before serving. A refreshing summer cocktail perfect for an evening barbecuing with friends or an upscale dinner party. Fill shaker with ice. Add approximately 1 1/2 ounces vodka and 3 ounces lychee juice to shaker. Cover and shake until contents are chilled. Place one whole lychee at the bottom of martini glass or cut a slit halfway through the lychee and slip it onto the edge of the glass. Strain contents from shaker into glass. Drink and enjoy.